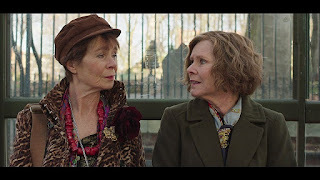 FindIng Your Feet is a senior-seasoned comedy directed by Richard Loncraine that glances at real life and limitations of time in people ever changing life. This movie embarks on two sisters from different background, the upstanding, snobbish, Lady Sandra Abbott, (Imelda Staunton), whose life seem artificial and stilted, after she discovers her husband had been having an affair with her best friend for over five years, to her high-energetic, free-spirit, out-spoken sister Elizabeth, known as Bif (Celia Imrie), who lives life to its fullest, hubristic in self-confident as she enjoys the moment as it comes. Life takes a roller coaster for Sandra after she leaves her husband when she moves in with Bif. Although, Sandra believe that she and Bif are totally opposite they find their balance with each other through friendship, trial and error, and dancing. With Bif’s great friends, Charles (Timothy Spall), Jackie (Johann Lumley), and Ted (David Hayman), Sandra soon learns to forgo her unpleasant, peevish ways when she discovers that time is of the essence. She soon finds comfort in attending the weekly community dance classes. This group of friends show Sandra that life is not always abrasive, boorish or dull if she let herself be free to be spontaneous and advantageous. But once tragedy hits home with Bif dying to cancer, Charles’s wife passing away and Sandra reuniting with her estranged husband only to discover that life is fleet. It is when Sandra tests the water with Charlie, she realized that her old life was habitual and mannered. This movie is for an audience who can enjoy a warm, witty, laughable, but entertaining movie. This movie shows that changes in life can be rapid yet withering for seniors in terms of embracing divorce, romance, new friendships, health and death. The characters were enjoyable and complimented one another. It was a bit slow as for keeping the audience engage at certain period of the movie. There was a bit of musical selections where the group from the community dance class put on a performance that took away from the structure of the movie but nevertheless entertaining. Overall, I gave the movie a five out of 10.